Infiniti’s QX70 sport utility is loaded with a lot more sport than utility although it falls into the genre of a car-based SUV or crossover featuring some measure of off-road and bad-weather capability. Infiniti’s QX70 line, introduced in 2003 as the FX, may be best suited for the sports car addict who just can’t let go but needs more space for passengers and cargo. There have been some incremental changes since 2003, the biggest coming in 2009 with styling, structural and technology updates. The second biggest change came in 2013 when the long-running 3.5 liter V6 was replaced with a more performance-oriented 3.7 liter engine. And now the FX37 and its higher-horsepower sibling, the FX50, have undergone a name change as part of Infiniti’s decision to make all things in the company’s SUV hierarchy begin with a Q. Despite the new designation, the QX70 3.7 is basically a carryover from the 2013 FX37. The energetic 3.7 liter V6 generates 325 horsepower and 267 pound-feet of torque. That represents a 22 horsepower increase over the old V6 making the aerodynamic crossover even more responsive, to the tune of 6.2 seconds from 0-to-60. If you want more performance measured at around 5.5 seconds, and a bigger price tag, opt for the QX70 5.0, which carries on with a 5.0 liter V8 that produces 390 horsepower and 369 pound-feet of torque. Only one transmission is offered-and it’s a good one, a refined 7-speed that features a wide ratio of coverage and wide lock-up area, as well as a manual shift mode, Downshift Rev Matching and Adaptive Shift Control. Perhaps most rewarding in the real world is the way the QX70 leaps ahead at the touch of the throttle, responding with gusto. The suspension is tuned toward sports car handling with a strut-type front suspension, an independent multi-link rear end and large front and rear stabilizer bars. It’s so firmly tuned that the ride can be jarring over irregular pavement and can be bouncy on small dips in the road. 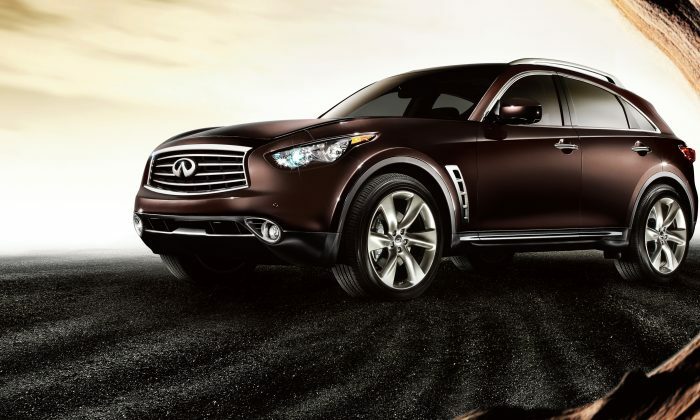 The 2014 QX70’s refined, aggressive stance serves notice of its performance underpinnings with its long hood, stretched wheelbase, and short front and rear overhangs. The bold front grille and fascia design are framed by signature High Intensity Discharge (HID) bi-functional xenon headlights and standard fog lights. The QX70’s silhouette is highlighted by a strong front-to-rear shoulder line and integrated rear spoiler, while its large LED taillights extend beyond the body, helping create aerodynamic downforce. Large dual exhaust outlets with chrome finishers cap the action-ready appearance. One of the design highlights for us is the rounded front fenders that rise into view adding a touch of old-time muscle not found in any other sport utility. The QX70 can accommodate four adults in relative comfort, even with the sloping roofline. Luggage capacity is a useable 24.8 cubic feet and cargo capacity measures 62 cubic feet in the utility department. The QX70 with its performance and handling is still capable of doing light off-road work as noted, but towing is limited to 2,000 pounds with all-wheel drive. Towing with rear-wheel drive is not recommended. The interior of the QX is luxurious with lots of soft-touch surfaces and nice-to-the-touch leather. The seats are big and comfortable, and the dashboard layout is almost as futuristic as the exterior design, but without the dreadful controls that invaded the industry such as the Lexus mouse and cursor. Switchgear is easy to operate and the navigation screen is delightfully easy to read. There are redundant audio controls on the center console-including pre-set radio buttons-so that it can be tuned without getting into the navigation screen. What a novel idea. The QX70 3.7 can be purchased in rear-wheel drive or all-wheel drive with a rear-wheel bias to maintain its nimble and sporty car-like handling capabilities. It’s about a $1,500 option. Four trim packages, Premium, Deluxe Touring, Technology, and Technology Sport are available. Premium at $4,300 includes such things as climate-controlled front seats, hard-drive navigation, and Nissan’s innovative Around View Monitor with moving object detection. The Touring package at $3,300 includes 20-inch wheels, and quilted leather-appointed seating. Technology, priced at $2,950, includes a full range of safety features including forward warning collision, adaptive cruise control, lane departure warning, and auto-leveling headlights. Sport Technology adds such things as solid magnesium paddle shifters, rear active steer, and continuous damping control. Our rear-wheel drive test vehicle with a base price of $45,945 came with the Premium, Touring, and Technology packages bringing the bottom line to $56,495.